Apart from camomile extract, this balm contains aloe vera extract known for its soothing and healing properties. The added vitamin A together with vitamin E promotes healthy skin growth. The balm's consistency is comparable to that of a lotion - it is easy to massage into the skin and cuticles and is readily absorbed without leaving a greasy feeling. I'm used to richer lotions, and find this a bit watery. I'm not seeing any improvement, but will give it some more time. I have it by the kitchen sink and use it each time - which is a lot!!! This is my nightly go-to hand cream. 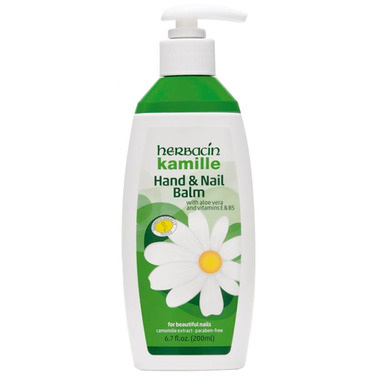 It absorbs easily without being greasy, and it does a good job moisturizing my hands and nails.